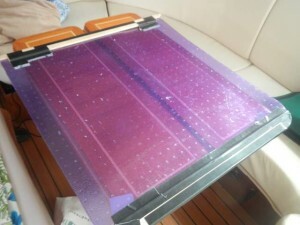 Hatch boards (wash boards) are plastic boards that slip into slots in the companionway to close off the cabin from the cockpit. 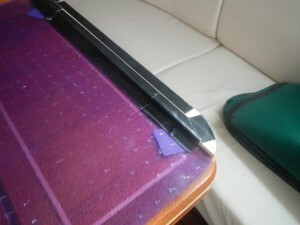 When at sea it is important for these boards to be strong, heavy, and water tight to prevent a wave from washing over the stern and crashing though to the cabin below. 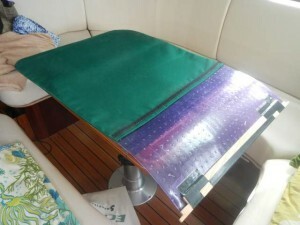 When the boat is locked up, the boards need to be substantial for security. We have been living in a marina in Puerto Rico for the summer. 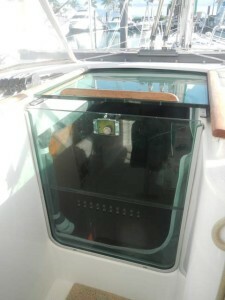 In this case we need to keep the companionway closed for air conditioning below. Although I had fabricated brackets to store the boards, the heavy boards are a real pain to install and remove each time we leave the cabin. To make life easier I fabricated a light weight fabric / plastic door that is very easy to use one handed. To start, I needed to find a piece of soft and flexible plastic to use for the core of the door. I wanted something rigid enough to fit in the board slots, but flexible too. I found a office chair mat at Office Max that was cheap and seemed to fit the bill. The mat did have nubs on one side that I had to slice off with a chisel though. 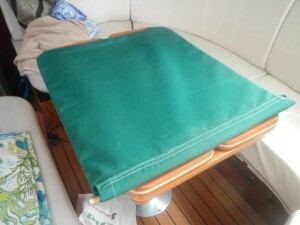 Next I cut the chair mat down to exactly the size of the 2 original heavy boards. Next step was to fabricate supports for the top and bottom of the door to make them stiff. On the top I cut them like a “T” so they would bear on the companionway top. On the bottom I cut so they would conform to the bottom of the hatch board slot. Since the supports would be covered and retained by a fabric envelope, I just attached them to the plastic sheet with duct tape. Next I sewed a envelope made from Sunbrella with a velcro closure on top and inserted the plastic sheet inside. The finished product can be installed in the slot just like the heavy boards or, more conveniently, just hung from the companionway top. It only weighs about a lb and is very easy to use one handed. Cool! 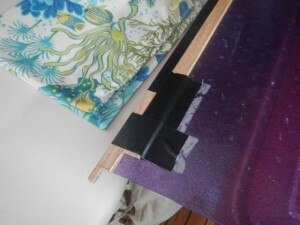 Our solution was the shade that Linda made a sliding drape that was attached to a spring loaded device that worked kind of like yours. I actually like yours better, but ours did OK for 5 years. When it got dirty it went in with the wash. Looks like you have the same concept. Quite nice! Thanks Cap. Good to hear from you. I hope all is well shoreside.